Thanks everyone for coming and supporting the first of many events! The next post will be titled: “What is Next.” But right now I must thank everyone who came and participated today! When I started organizing a Tea Party a few weeks ago, my hope was to be part of a grassroots movement that would engage as many people as possible. The intent was to start something that would grow. Thank you thank you thank you to all who came, worked, advertised, donated, signed up to be part of the ongoing effort, or had any other part in today’s event! The event went wonderfully and was a great success! We had many great speakers, from many different backgrounds, each as passionate as we all are about preserving life, liberty, and the pursuit of happiness for ourselves and our children. Thank you so much speakers! We had many people come! One of our policeman estimated 500 attendees. Wow, I was hoping for 120 when I started this! 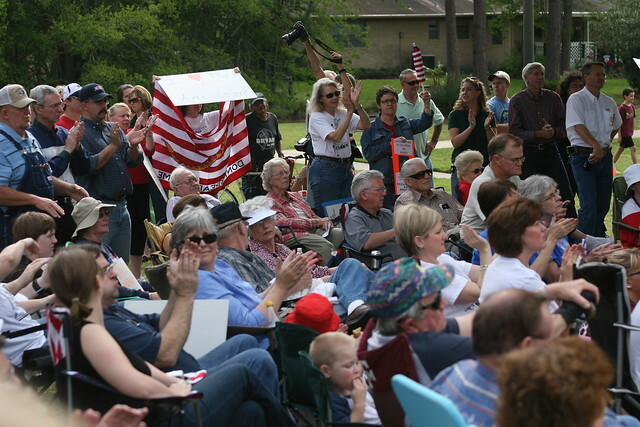 I heard there was a great turnout at the Veteran’s Park Tea Party also. Excellent! We had more than 300 people sign up to be part of our email list!! We are all part of the start of our base, and we’re moving on from here! If you’re not on that list and would like to be, please email me. We have a full box of signed postcards to be sent to our senators and representative. That is power, that is your voice!! We had many, many people donate generously! We were able to pay the three off-duty policemen who worked the event from your donations, and were able to give them proper tips. I haven’t counted the remaining funds yet, but it looks like we’ll be able to pay for the printing and mailing of all the postcards that were signed. Thank you all! We were able to join our voices with Tea Parties all across the nation! And in District 17, the organizers of the Burleson and Waco Tea Parties are working with us to get our long, stretched-out district connected strategically. No more Chet Edwards saying one thing in one part of the district and something else in another and not getting called on it! And perhaps most importantly, we were able to see that we are not alone in our frustration. There are a lot of us! We must stay connected and grow as a group, not letting anything divide us! Please join me in making a firm and deliberate choice to not let anything put you off from our main goals–less government, less irresponsible spending of too many of our tax dollars, and more representation of our views in Congress. If you read or hear anything disparaging about the Tea Party movement in general or our event in particular (and you surely will), or feel discouraged, disappointed or disillusioned in any way, please go back and reread the bullet points above. Remember, it is about numbers of us working together. That can only be stopped if we give up. So, no matter what, please make the conscious, deliberate choice not to do that, and we can, and will, win! I would like to thank you for organizing our area’s Tea Party. My wife and I, along with my best friend from the service, his wife, and their two kids were privileged to attend. Thank you for a job well done. This would not have happened if not for people like yourself who took the time to attend the event. Thank you!! Thank you all!! Even thanks to all who wanted to come, but were unable to attend because of prior commitments. This is a growing grassroots movement – a call to all patriots and lovers of liberty. I have added you to our contact list. There will be future events and actions. The website will become a place where news can be posted about what is important in this area. The Tea Party was just the beginning. Thanks to you and your family for attending the Tea Party. I’m glad you enjoyed yourselves! Thank you Nancy for all your hard work and money out of your own pocket for this event. You are so right to say that we must remain motivated to keep up the efforts to return our country to it’s founding principles. May God guide us forward in our efforts. Where would I have been without you!! Thanks for holding my hand through the entire process. What a great bond of friendship we have formed as we work to ensure Mary gets to enjoy the same freedom we enjoyed. Little Mary is why we are doing this and all the other “Mary’s” out there in our community. Thank you to everyone who worked so hard to make this event happen. Where can we get some more post cards to send to our representatives? Do you have some place where we can pick them up? Yes! we still have some postcards to send to our Congressmen. If you would like to email me personally with your contact information, I can either mail them to you or arrange to meet you to give you some. Anyone wanting more postcards just follow the same instructions. Let’s not let any of these go to waste. I plan on taking a picture when I deliver these to the post office. Everyone needs to see how many people participated in this project!! Thank you for organizing the event. I would like to volunteer to assist in whatever way possible for the next gathering. I live in Calvert but the distance is no price to consider when looking at the alternative. I think you should consider another gathering sometime in the week of Memorial day, May 25-30 before a big rally on July 4. Please let me know how I can help. Yes, we will be having future events and calls to action. I have added you to our growing list of email contacts, so you will be hearing about what’s next. Right now, I’ve needed a little down time, but am getting back to speed. So, I apologize for that. Keep checking back with this site to learn more. Thanks for wanting to stay involved. This is what the event was all about – growing a grassroots movement. representative since I retired in April 2008.